Chembur has a hot new spot to chill out at and here’s looking at you, coffee lovers. The Koffee Works in Chembur is the latest addition to the neighbourhood’s cafe scene. Started by Ishanee Amar Haware, it sits pretty on Sion Trombay Road. Did we tell you we absolutely love their decor? There are mug-shaped lamps on the walls that illuminate the space aesthetically, there’s greenery that makes the cafe look super pretty and a casual vibe that makes it great to chill out at. 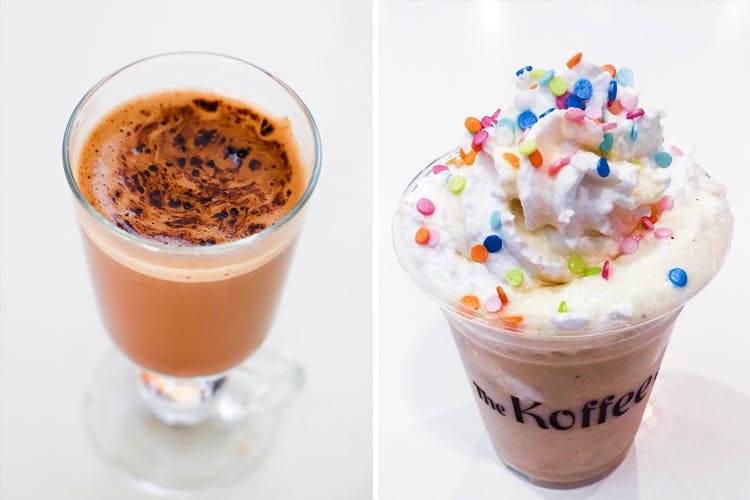 The menu is a mix of coffees, coffee-based beverages, milk shakes and more. There’s Flat White, Affogato, Matcha tea, Turmeric latte, Matcha latte, Vietnamese Caphe du, Espresso Lito, Kesariya Thandai, Banoffee Pie, Cheesecake, Brownie crumble, Smoothies, Coolers – chowpatty kala katta, mango and more. Chembur, you have a thriving scene and we’re happy that The Koffee Works makes it even better!